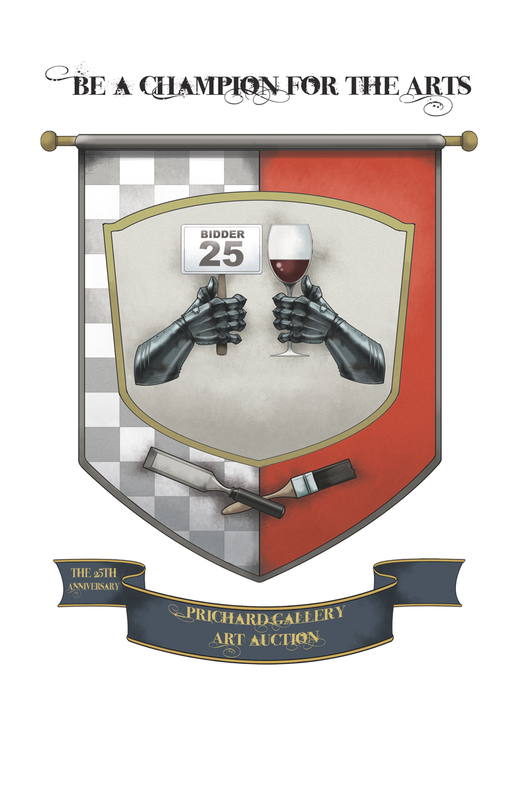 The Prichard Art Auction is an annual event that raises much needed funds for a very fine art gallery. As an undergraduate, I helped out in the Prichard as a show installer. 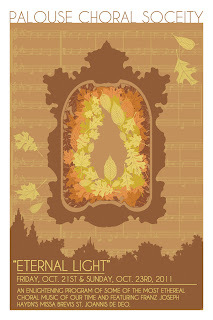 I helped put together quite a few shows, including one by Andrew Goldsworthy. It's SO COOL to be able to work on these posters. 1.) It's an organization I love, not only because of the history I have with them, but also because of the phenomenal work they continue to do. 2.) It's staffed by phenomenal people I genuinely like. 3.) It's a great cause. It literally makes our town a better place to live. 4.) There are no constraints on the posters. That stands to reason, given that they're artists and are used to advocating for creative expression. But even with conditions like that, it's easy to get prescriptive about an important event. They don't, though. They seem to enjoy the surprise and the variety (remember last year's caveman poster?). So, here's what I presented to them. 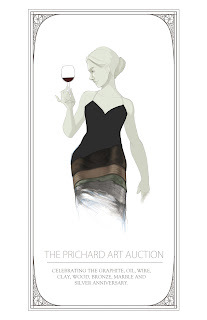 The first is based on art as represented by mediums (not the Dionne Warwick variety). I've always loved the tactile elements of art (even more so now that I work digitally). I love the smell of oil clay and paint and wood shavings. This concept is an ode to those mediums. I also forgot to mention that this year is the 25th anniversary of the gallery, which is the "Silver Anniversary". So the text is also a reference to that. It's also an homage to "Madame X", a famous painting by one of my favorite artists of all time, John Singer Sargent. Concept two: Stemming from one of the Prichard's missions, which is to champion artists, I drafted up this idea. In this scenario, though, the auction acts as the arena in which people can be champions for the gallery itself. Kind of like being a champion for a champion. The background of the banner is based on some of the Prichard's design schemes. Ultimately, though I like the concept, I think it's a little dark for an event where people are supposed to be having a nice evening. 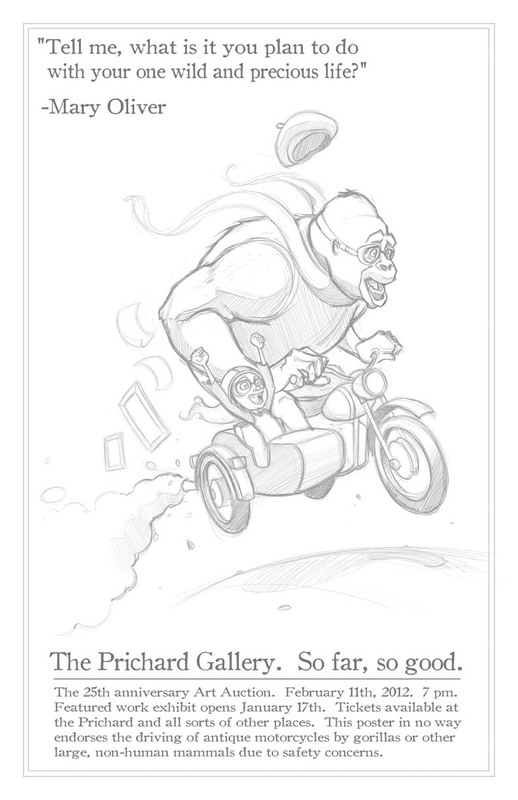 Concept three: My goal here was just to be irreverent (in spite of my reverence for the gallery). I suppose I wanted to shake off the visual expectations of a poster for an elegant event (self-imposed expectations, I should note). Art is many things to many people. For me it's fun. It represents the lust for life I try constantly to maintain (and seldom do). The gallery is a great embodiment of this outlook. The quote on this one is by a poet named Mary Oliver, who wrote my favorite poem ("Wild Geese"). One of these concepts has been chosen, but I won't tell which until later. This was a pretty quick, fun little project. It's the label design for a box of seasonal ammunition for a local company. Concepts first, then the final. 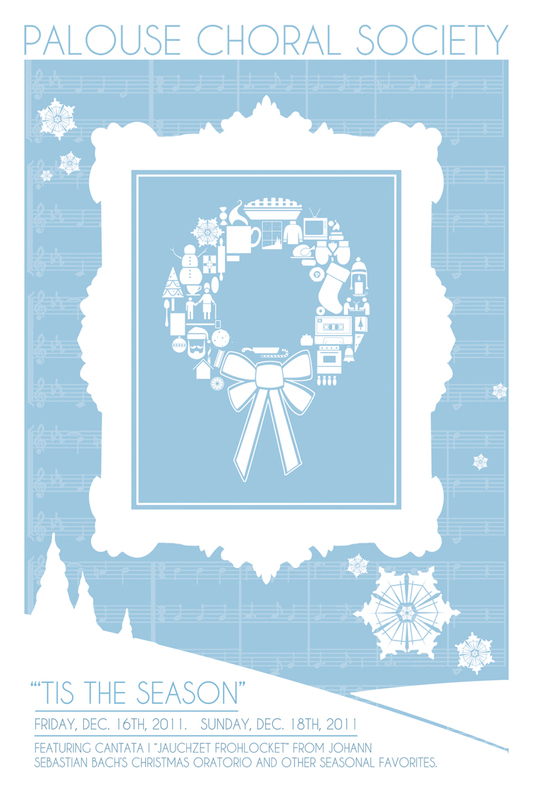 I'm not sure why, but when beginning the concepts, I began with Winter. Maybe because the visual elements were more visually appealing to me. 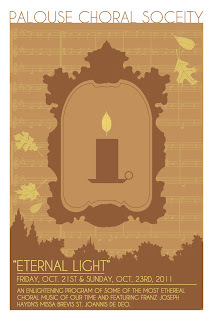 But, having hammered out the Winter poster, I realized that this year Fall came before Winter. I was stunned when I found out. Particularly because it meant I had put up the Christmas tree way too early. 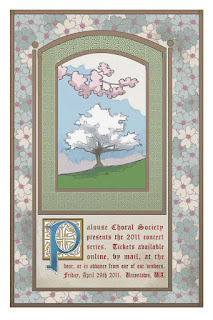 It also meant the Fall concert (and subsequently the Fall concert poster) would be coming before the Winter concert and poster. In spite of my request to make an exception this year and have Winter before Fall, traditional order was kept and I was forced to come up with the Fall concepts. And here they are. The second is the poster that was eventually chosen after a few minor changes. 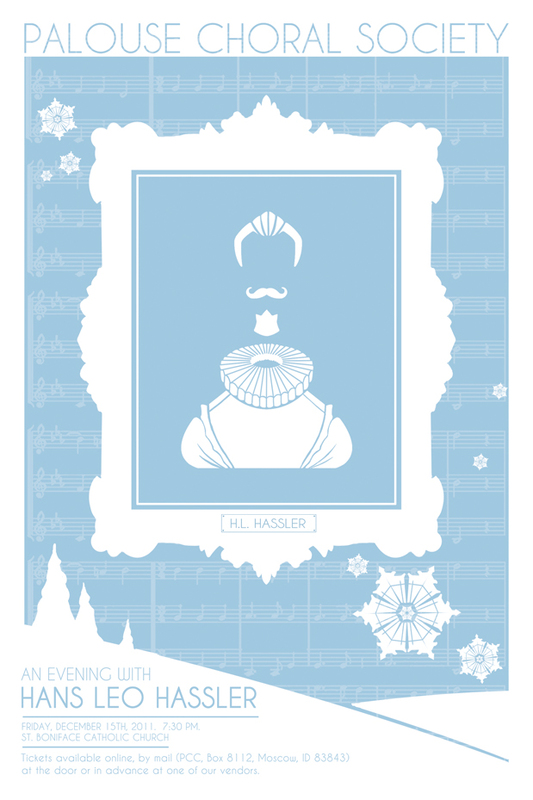 "What gets put into the frame, then, if it isn't the composer?" I asks myself. 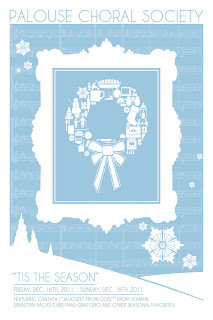 Well, the concert's selections are essentially Christmas incarnate. Many of these songs, even if you don't recognize the titles, would be instantly familiar to you. Probably familiar to you in the way the smell of cinnamon is familiar, which is to say that, like music, the physical presence/reality of the thing is greatly augmented by the emotional memories it contains. Along with symbols, pictograms and silhouettes, I've also been experimenting some with composite images comprised of those visuals. It irks me a bit to see oversimplification (this, he says, after touting the beautiful simplicity of symbols). Seriously, though, most things are way too complex to sum up with a single visual element. So...why not use multiple images? That was the genesis of this first derivation. Two thoughts about it: One, the candle under the hat makes me nervous. It's a symbol of a candle and a symbol of a hat. These things don't exist except as 2-dimensional representations of objects. But still, that's an unsafe place to put a symbol of a candle. It could start a symbolic representation of a fire and ruin the holidays for us all. Second, the cassette tape is my favorite element. My favorite Christmas music was a mix entitled "A Very Special Christmas" (on cassette tape, of course), which was a mix including the likes of Sting, Run-DMC, Bryan Adams and Stevie Nicks. Boo yeah. 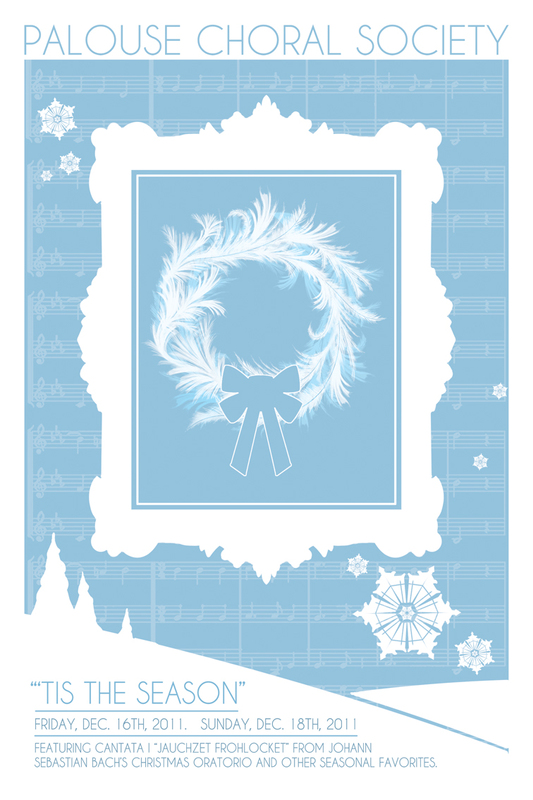 Concept two is a wreath made of frost. Few things are as beautiful and graceful to me as frost. The correlation between frost and choral music seemed perfect in my head, even though it deviates from the more simplistic silhouette-type images. 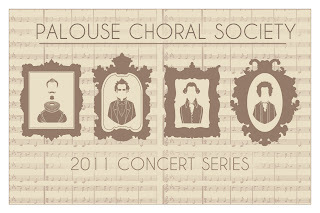 Ultimately, this poster was chosen as the final for the December concert. Oh, did you think we were done? So, while I really liked the idea of the pictogram composers, there had to be a method of distinguishing the posters from each other. There are four concerts this season, which correlates nicely with seasonal visuals. Thus, this concept was born. I liked this one quite a bit. Hassler was a stylish fella. I'm pretty sure he was having Thanksgiving dinner one evening (probably a Thursday evening), looked at the turkey and thought, "Hey, those paper things on the turkey legs would look great around my neck." When presented, however, there was concern that the visual of the composer was too obscure. I couldn't disagree, so even though I loved the composers idea, it had to be 86-ed. 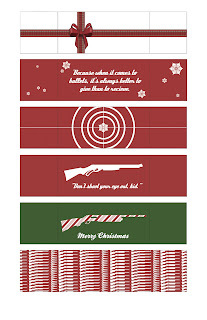 Other elements and the overall style of the poster were well-liked (the seasonal elements, the frame, and the landscape) and the subsequent concepts were built around those themes. Whew. Glad I got that off my chest. I think we all feel a little better now. "Well," you might be thinking to yourself, imaginary reader of this blog, "I accept your apology for the post hiatus, but what exactly have you been doing with yourself lately?" I'm glad you asked that. Because unless you read the title of this post, you'd have absolutely no idea. I've been working on any number of things. One of them (as evidenced by the previous post) is trying to learn animation. It's not a speedy process. The learning curve is steep and it's extremely time-consuming. I'm currently working on the second animation at the moment. Apparently, it's healthy to feel out of your comfort zone as this feeling is indicative of growth. I guess I'd just forgotten how often growth and the feeling of incompetence are synonymous. 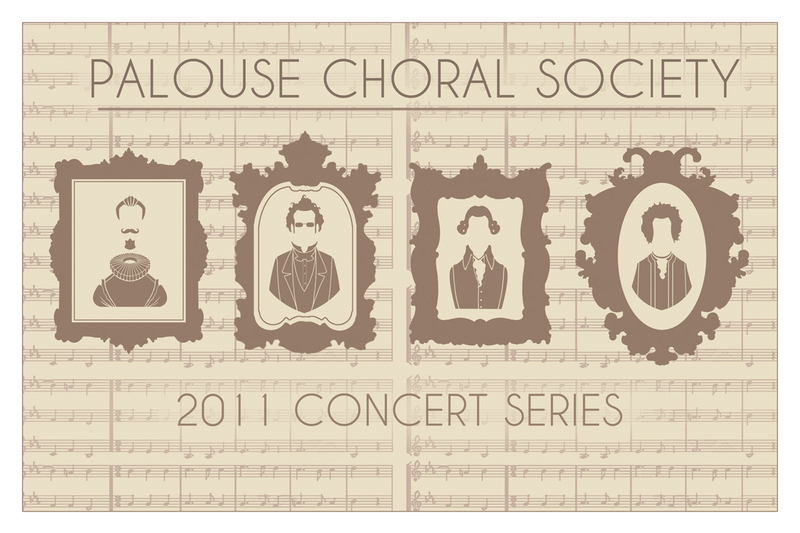 One of my other projects has been, as the oh-so-germane title points out, concert posters for The Palouse Choral Society. I met with the PCS team earlier this year to talk about the logo and the posters. Like the logo project, this project has seen a pretty significant evolution between the initial concepts and the finished posters. That change is usually an interesting one to watch. It's even more interesting when you're right in the thick of it. Here's the thing: Music is extremely visceral. Describing music can be a daunting task. You can describe the lyrics or the notes in a concrete way, but it gets tougher to describe a melody (even if you specifically list the notes) and explaining the emotional complexity of the music is a handful for anyone. That's probably why the "Draw Music" assignment is so ubiquitous in early design classes. Striking the right emotional chord to visually describe a specific kind of music is hardly a science. Add to that the goals of the organization itself and the plethora of opinions from everyone involved and you'll probably end up with a project that changes quite a bit over time. Which is exactly what we have here. Up front, we have three concepts. 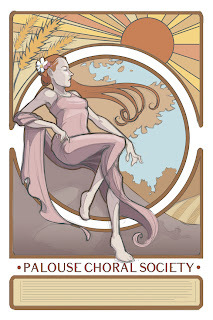 One is based on the work of Alphonse Mucha. 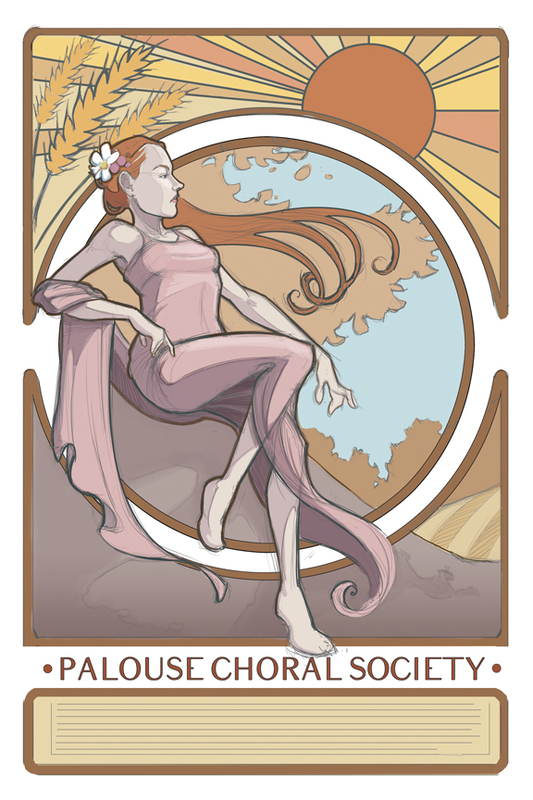 I spent quite a while obsessing over the work of Mucha. I've always been a great admirer of the craftsmanship and its graceful figures and exacting lines seemed like a good fit for choral music. Concept two is based on an illustrated manuscript. Because of their painstaking detail and spiritual affiliation, the illustrated manuscript also seemed like a perfect visual representation for the concerts. However, after spending quite a while on this concept, I took a step back and realized I hated the damned thing. So this one was never presented as an option. I think it's ugly and amateurish, even for a concept. The third concept came from a recent fascination with silhouettes, symbols and pictograms. I like the simplicity and elegance of these kinds of illustrations. More than that, though, I like the potential for humor in them. They're so often used as serious means of communication (traffic signs, for instance) that putting them in other contexts seems funny (to me, anyway). So I applied that idea to the composers responsible for the music in the concerts.